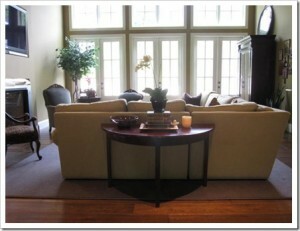 Ever wonder what makes the difference between simply placing a sofa table and really presenting it? Here are a few tips to make your table talk! Choose a table to scale. 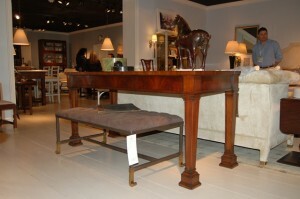 This means find a piece that fits the sofa and really anchors the two together. Stay away from tables that appear to ‘float’ behind the sofa. Think outside of the box. 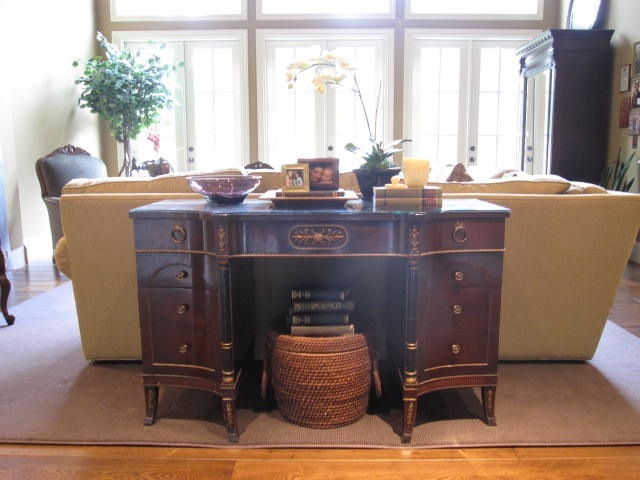 Use another piece of furniture in place of the standard sofa table, such as a desk, a vanity, or a narrow buffet. Create height and interest. Establish your focal point and work in a triangle from there. And don’t forget, symmetrical placement isn’t the only way to achieve visual balance. Layer, layer, layer. This is all about mixing up the colours and textures of your objects (fabrics, woods, glass, mirrors, etc. ), and how you go about placing them together (overlapped, on top of, in front of, to the side of, etc.). Don’t stop at the table. Remember to fill in the area below the table. This is the difference between just placing your table, and really presenting it! Have fun. This is your statement, and a great scape is to ‘e‘scape from ‘rules, ‘rights and wrongs’, and ‘shoulds’… But if you must, then keep in mind the ‘Rule of Thirds’ to help you stay on track for picture-perfect results. Oh, and one last tip, don’t be afraid to change out your ensembles and vignettes from time-to-time. Mixing it up with the seasons is a nice way to keep your look fresh. Next PostNext What Does ‘Coming Home’ Really Mean?